Jaipur is the capital of the state of Rajasthan, which is the best place in India. It is known as the pink city. Being a Wedding Destination in Jaipur is a new trend among the youth, Hari Mahal Palace is one of the most loved wedding resorts in Jaipur, which is your superb Wedding Destination, Jaipur's finest wedding venue. As you know that a wedding day is not just for you and your guests, but it is the most awaited day for you and your parents and your relatives. Because marriage is not just an opportunity, which is just with you, but a proper planning is needed for marriage, including destination and place. So If you are looking best wedding venue in Jaipur then don't wait consult with Pachar Group of Hotels and Book Hari Mahal Palace, because Hari Palace Palace offering the best Heritage wedding Resort in Jaipur. If you have choose this place for your wedding then you should be happy to know that This Wedding palace can be a place for the most anticipated day of your life. Yes, this is the most beautiful and the Hari Mahal palace is the perfect place to tie your knot. And to reduce the stress of your D-Day preparations, we have shortlisted these best wedding venue in Jaipur, for whom you can make the most beautiful ceremony! While Pink City remains beautiful all year, here is the best time to plan a wedding during winter, when the weather is absolutely enjoyable to step out. Therefore, if you are getting married at the end of the year, then consider yourself really lucky for the destination of Jaipur! Hari Mahal Palace is one of the best venues for your destination wedding in Jaipur with many options. As we know that Indian Wedding with all its elaborate pomp and ceremonies will find the requisite spectacular venue like no other, at Lebua Resort, Jaipur. 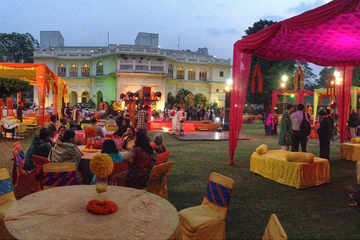 Wedding Ceremonies and celebrations are held in the Hari Mahal Palace. Hari Mahal palace is also famous for Wedding Reception, Business Meeting, Adventure Party, Special Party and Brand Promotion along with wedding destination in Jaipur. If you are planning for a destination wedding at Hari Mahal Jaipur with Pachar group of hotels then you enjoy heritage experience at your wedding. Pachar Group is famous for its hospitality services and we provide the best destination wedding services for your wedding. our many hotel chains and wedding resorts available in India like Aaram Baagh Udaipur, Aaram Baagh Pushkar, Hari Mahal Jaipur, Aaram Baagh Agra, etc. Pachar Group started our business in 1985 Pachar Group is famous for its heritage hotels and wedding resorts. If you plan Wedding destination in Jaipur then you can enjoy luxurious looks and traditional cultural activities with Pachar group. Pachar family entered the hospitality industry in 1995 with Pachar group. It is also running many heritage hotels and wedding resorts. Hari Mahal Palace is the part of Pachar group. It is famous for its heritage rooms and luxurious looks with lavish green gardens. It's an architectural style mixture of Rajputana, Mughal, Britishers. Hari Mahal is expressing the best heritage looks at your wedding. It is located in Jaipur. Jaipur is known as pink city and famous for heritage hotels, forts, etc. Hari Mahal palace is the best weeding resort in jaipur to book now enjoy memorable movements in your wedding. For more info please contact us. 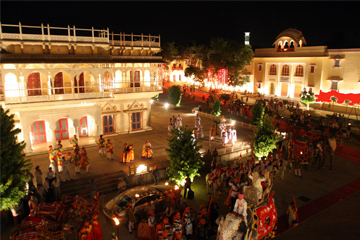 Hari Mahal Palace is the best wedding venue in Jaipur. Hari Mahal is the part of Pachar group. Pachar Group is famous for its heritage hotel and wedding resorts. The inner part of the Hari Mahal palace is very beautiful like the gallery, hotel lobbies, banquet hall, conference room, etc. The architectural style of the hotel gallery is very attractive. It is the combination of modern and heritage design to feel like heritage forts. The Conference room designed as heritage looks and the best part of the conference room. It is a combination of Rajputana Style, Mughal Style. All rooms designed as in heritage looks. The design of rooms wall is a combination of Rajputana Style, Mughal Style. The galleries of the hotel look like as very beautiful. The outer part of the Hari Mahal palace is very attractive. Green Lavish Garden is the center of attraction in the hotel. Jaipur is famous for its heritage looks and traditional culture. Book now Hari Mahal palace and enjoy the wonderful moments at your wedding. For more about queries contact us. Today lots of people do heritage marriage because They can enjoy heritage looks and royal experience at their wedding. Pachar Group is famous for its heritage hotels. It is also running many heritage hotels all over India like Aaram Baagh Udaipur, Hari Mahal Palace Jaipur, Aaram Baagh Pushkar, Aaram Baagh Sanchi, etc. If you are planning the wedding at heritage and royal styles. We provide pre-wedding ceremony, theme wedding, royal and heritage decoration, Traditional foods, Vintage car For wedding purpose, Royal Baghi for wedding purpose, etc. We provide heritage and royal looks at your wedding like flower decoration, Theme decoration, Banquet hall decoration, etc. We also design a banquet hall in royal looks than you can enjoy heritage experience in your wedding and royal Baghi for weeding purpose, vintage cars for wedding purpose to enjoy the royal experience at your wedding. Hari Mahal Palace is the best heritage wedding resort in India. make your wedding heritage and royal looks than it Is a memorable life experience for you. Book Now Hari Mahal palace for more info contacts us. We provide decoration service like room decoration service, banquet hall decoration service, Lawn decoration service, flower decoration service, Wedding car decoration service. We also provide theme wedding service. Theme design depends on your budgets and requirements. Decoration design depends on your budget and requirements. We provide pre-wedding service at your wedding. pre-wedding ceremony facility available like ladies sangeet, Mehendi functions, engagement functions. We also design decoration in the pre-wedding ceremony like banquet hall decoration services, Flower decoration service, Stage decoration service, lawn decoration service. These services are available for your requirements and budgets. Catering facility also available for wedding purpose. Our Caters provide delicious and traditional foods at your wedding. We provide a makeup artist, Mehandi artist at your wedding. These facilities are also available at Hari Mahal Palace Jaipur. Hari Mahal is the best wedding resorts in Jaipur and Book now Hari Mahal Palace and enjoys memorable moments at your wedding. For More info contact us. 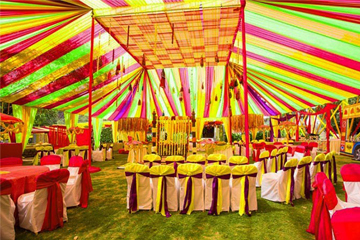 Jaipur is the best destination for wedding purpose. Many Bollywood Celebrities, Hollywood Celebrities, Businessmen come in Jaipur for wedding purpose. It is famous for its lakes, heritage hotels, temples, etc. Many heritage hotels and wedding resorts available in Jaipur. Jaipur is the capital of Rajasthan and it is also known as the pink city of India. All the buildings designed in pink color. Jaipur is famous for traditional looks and cultural this reason many visitors come from foreign cities and the other states of India so They can very well be known about Jaipur traditional and cultural activities. Many palaces are available in Jaipur like Amber Fort, Nahargarh Fort, Jantar Mantar, Hawa Mahal, Jal Mahal, The city palace. It is also famous for its traditional foods and sweets like Dal Baati Churma, Gatte Ki Sabzi, Missri Roti, Ghevar, Mawa Kachori, Moong Thal Chauguni Ke Foods, etc. Jaipur is famous for its hospitality and culture. If you are planning to destination marriage than consult with Pachar group. 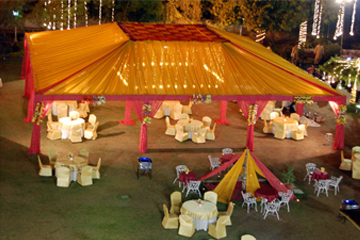 Hari Mahal Palace is the best wedding resorts in Jaipur for more about info please contact us.